I was in awe of my grandmother, Becky, a white woman from Paddington in London who had, sometime in 1901-1902 while on holiday in Kingston, fallen in love and against all social convention of the time married a black Jamaican. So writes Marie Campbell, in an intriguing account of her own journey almost a century later, in the footsteps of her adventurous grandmother. 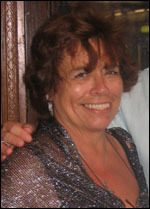 Marie traveled from London, England, to Jamaica, to meet cousins and other relatives, who helped her discover her origin. "I discovered a story of cruelty, revenge and jealousy inflicted on an innocent young woman and how she demonstrated huge moral courage, dignity, resilience and, in particular, love," says Marie. Her first discovery was about her mother, who in England was known as Carmen Browne. 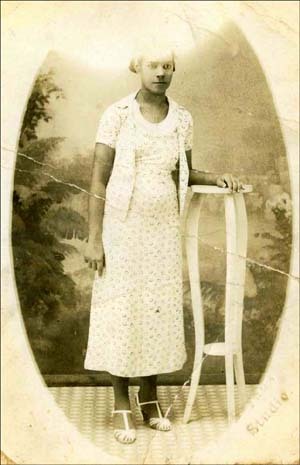 Her real name was Olga Browney, born and raised in Kingston, Jamaica. 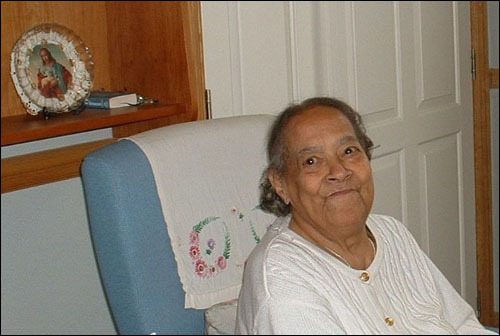 She was one of 11 children from a close-knit, colored Catholic family. A kind, naive and gentle girl, her mother had arrived in London in April 1939 and lived with "a malevolent, alcoholic aunt," intending to stay for only six months. However, the outbreak of World War II, personal tragedy and malicious intent had prevented her from returning home to Kingston. "I learnt what a remarkable woman my mother was," Marie wrote. "Because of circumstances, she made a choice which resulted in her losing contact with her beloved family in Jamaica until nearly half a century later when her past caught up with her." "When I visited my family in Jamaica in 1996 only six of Mum's siblings were still alive: Boysie, Birdie, Pearl, Chickie (christened Kathleen), Ruby and Dolly. Boysie was living in Canada and I never got to meet him, although Mum spoke to him on the phone. "It was wonderful to finally meet some of Mum's family - my extended family, the family that as a child I'd always longed for but which, in the main, Mum didn't like to talk about. She'd say, 'it makes me sad'. But ironically, when she was sad, that was when she'd open up a bit and I gleaned little bits of information about her family. I knew that as small children Mum, Ruby and Dolly had been very close and it was interesting, as well as being a bit unnerving, to see just how much Ruby and Dolly looked like Mum." Two years ago, Marie migrated from England to join her son in Sydney, Australia. She has published her story as a book, which she is now posting, chapter by chapter, in the splendidly entertaining British daily online literary journal Open Writing. In addition, she maintains a lively blog. It wasn't just white and coloured Jamaicans who would have shown and demonstrated contempt for Becky, but the blacks as well. A white woman marrying a black man was unheard of at that time - in fact there was a time when it was illegal! I think that's one of the things I found most surprising during my research about my family; how, even after Emancipation, Jamaica had continued to practice Great Britain's colour and social prejudices - whites looking down on coloureds, coloureds looking down on blacks, and black accepting they were the lowest class in Jamaican society. My grandmother's social standing would have been on a par with the blacks or maybe even lower, if that's possible. MARTHA HAS TOLD US OF YOUR PLANS TO MARRY. PLEASE RECONSIDER. CANNOT AGREE WITH THIS MARRIAGE. IF YOU PROCEED YOU WILL CEASE TO BE OUR DAUGHTER AND DO NOT WISH TO SEE YOU OR SPEAK TO EVER AGAIN. WE BEG YOU TO RECONSIDER. Stand by for a Hollywood blockbuster based on Marie's book! Eric Shackle says he's been a compulsive writer ever since gaining his first job as a cadet/cub reporter in 1937. Now 89, he is OMNI's oldest reporter.